Symbols found on Pictish’ stones. Are they related to the Manx ‘Tehi-Tegi’, Irish Cliodhna, and other ‘mermaid’ traditions? 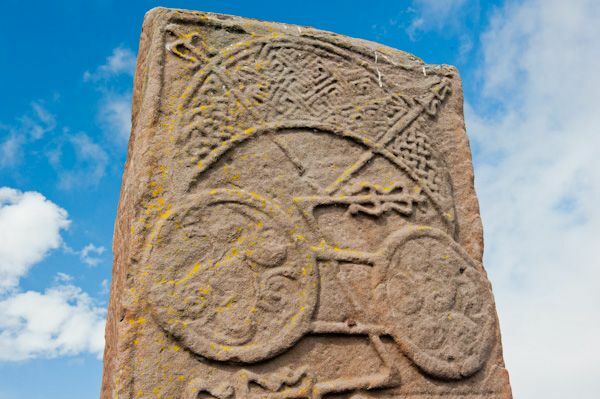 The curious rock-carvings found on the ‘Pictish’ stones of the eastern and lowland parts of Scotland have long excited curiousity and conjecture as to their meaning and symbolism. Having studied the ‘Otherworld’ traditions and legends of the ancient Atlantic Europeans, I am starting to understand the significance behind some of these symbols and would like to share a few of my thoughts on them. 1. The ‘Beast’ = A ‘Water-Horse’ or Porpoise-Horse hybrid. The steed of the ‘Fair Chooser’ which transforms when it dives into water conveying the soul(s) of the dead to the Otherworld ‘beneath the waves’ or ‘beyond the setting sun’. 2. Mirror and Comb: The attributes of the ‘Mermaid’ still used in modern depictions of this archetype. The mermaid represents the ‘Fair Chooser’ herself, and the comb and mirror represent her love of beauty as well as the following: The Mirror represents the inverted state of Otherworld-being and so is a metaphor for this world. The Comb represents a metaphor of the un-knotting of the tangles of life’s threads, in preparation for their refashioning in the otherworld. Scandinavian, Scots and Manx folklore contains many traditions about knots – in particular they were avoided about the person of a dead body, lest they return to haunt the living! 3. Crescent and V-Rod: The crescent represents a rising wave, as well as the Moon which propels the tides – various permutations of it contain swirl-patterns suggesting waves. The V-Rod geometrically represents a state of reflectional-symmetry in its gross appearance, but each arm looks different, representing the otherworld reflection and transformation. My conjecture is that this symbol represents the great wave which swallows the dead and therefore the transition to the otherworld. 4. Serpent and Z-Rod: This symbol expresses rotational symmetry of its geometric forms. This expresses a principle of repeat through cyclicity, rather than repeat through reflection, and introduces the idea of eventual reincarnation. The serpent is an ancient symbol of rebirth, based on empirical observation of its skin-shedding, its tendency to make coiled and undulating shapes with its body mimicking the cycles of the stars, planets and satellites of the sky perceived to influence nature through the tides, seasons etc. 5. Double Disc and Z-Rod: This is an expression of the cyclicity of the sun and moon in particular – possibly a comment on their inverted otherworld-relationship. The discs are bound together by a tie upon which the Z-Rod is centred. The rod is often decorated at each ends with plant-like elements.